The Brick by Brick had been remodled earlier that day, and carpet now covered the entire floor. Very high traction carpet. 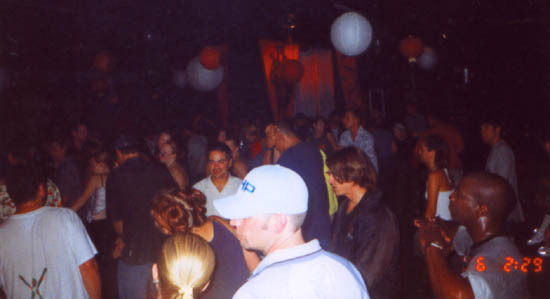 We all hope that a wood dance floor once again graces this chill venue. John B was spinning Jungle when I got to the October 6th Dragon Lounge. I won't get into detail about his set, but I will say that he is worth checking out. By the end of his set, everyone had a chance to get warmed up, and it was time for a cool down. I went outside to grab a smoke, and talk to other Junglists while Breakbeats filled the Lounge. 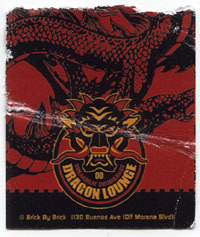 Jungle, Breaks, and then more Jungle is the format of the Dragon Lounge. After the first Jungle set, when the Breaks come on, is the perfect time to go outside, smoke, and go to the donut shop accross the street for a Rootbeer Float ($1.95) I suggest forgoing vanilla ice cream for Rocky Road. Back in front of the BBB, I was smoking a cig and finishing my Float, when I saw a familiar face. "What's up Dave?" I said. Dave shook my hand and said "Your face looks familiar, where do I know you from?" "Catwalk, at the Fox in May..."
"Oh yeah!" he said, so we got to chill for a minute and talk about his previous CDs. He said that he has a new CD coming out in January, which will be recorded live at the end of this month. If it is anything like his set at the Dragon Lounge, I will buy, not burn, a copy of the new AK1200 CD. Now that I warmed up, smoked, and had a Rocky Road Rootbeer Float, I was ready for the main event. AK1200's state-of-the-art all-new Jungle set. So new, in fact, that the record he started his set with will not be available in stores until 2002. A true "dub plate," AK got the record, a track he produced, in the mail only hours before his set. Was it any good? Well, let me say this: It took no effort at all to spring like mad to this record, not for me, not for anyone. The crowd looked like stormy waters, a furious sea of bodies no longer in control of their masters. When in the middle of a long rolling bass line I stopped, the music stopped as well. My arms pointed straight out, in total silence, the instant before everything was furious. When music is good, you can dance to it. When music is better, you feel like the music forces your body move. Sometimes, when the music is perfect, you feel like your body is making the music. Anything you do works. 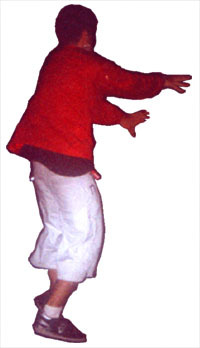 You shake your fists, and the beat changes to go with it, you jump in the air, and a new bass line starts, you stop for no reason, and the music complies. The rest of AK1200's set was more of the same, meaning that it was the best Jungle set I have heard in my life.